Micro USB with Adaptive Fast Charging. Micro USB devices. You can also sync and transfer files between your computer and Galaxy smartphone or other phone using the Micro USB cable. Rapid Charging. Output Interface: USB 2.0 Port. HTC, LG, Nexus, Motorola, Nokia, Sony, Huawei, Blackberry oneplus and more! - Starting a new chapter in USB charging, with faster technology, superior portability, one USB port. -Samsung Galaxy S8, S7, S6 Edge, S6, S5, S4, S3, Note 5, 4, 3,2 Tablet etc. For Samsung Galaxy S8 S8 S7 S6 S5 S4 S3 S2 Galaxy Note 2 3 4 5 7. High quality, good efficiency, low energy consumption and fast charging. 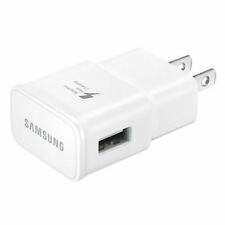 Micro USB with Adaptive Fast Charging. You can also sync and transfer files between your computer and Galaxy smartphone or other phone using the Micro USB cable. Micro USB devices. Rapid Charging. LG G5 G4, LG G Flex2, LG V10. Backward compatible with QC 1.0 and 2.0 Technology. Samsung Galaxy S7 / S7 Edge / S6 / S6 Edge / Edge Plus, Note 5 / Note 4 / Edge. iPhone 8 /8 Plus/ 7/ 7 Plus/ 6/6S/ 6/6S Plus/ 5/5S/SE/ 5C. Starting a new chapter in USB charging, with faster technology, superior portability, one USB port. -HTC, LG, Nexus, Motorola, Nokia, Sony, Huawei, Blackberry oneplus and more! -Samsung Galaxy S8, S7, S6 Edge, S6, S5, S4, S3, Note 5, 4, 3,2 Tablet etc. UNIVERSAL COMPATIBILITY. Smart circuitry protects your device from power spikes. 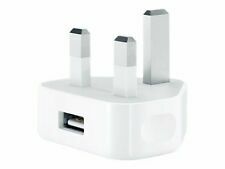 ==> Genuine Apple USB UK AC Power Adapter. Featuring a new ultra compact design. 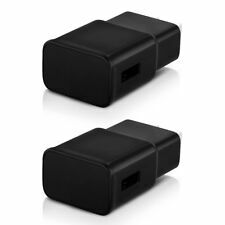 It works with any iPhone, iPad Mini and all iPod models with a dock or Lightning connector. ==> Genuine Apple product. 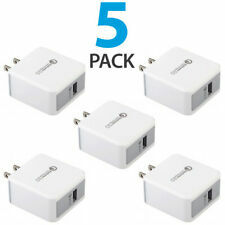 Apple original 5w USB Power Adapter. for iPhone, iPad, iPod & Apple Watch. Boxed new and unused, Apple code MD812B/C. Certified Safe: Anker's MultiProtect safety system and UL certification ensures complete protection for you and your devices. Anker PowerPort 5. If a port isn't working properly, it may be because your device has triggered the protective internal safety switch. Power adapter. 2.4 A (USB). Output Connector Type: USB. Product Type: Power adapter. 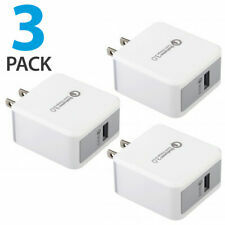 Output connectors: 4 pin USB Type A.
Apple MD812B/B 5W USB Power Adapter for iPad mini, iPod & iPhone. Product colour White. we do not take any responsibilty after this. Ending Soon. New Arrivals. QUICK LINKS. Audio Visual. USB 2.0 ports quantity 1. Ports & interfaces. Manufacturer Part Number: F8M731DRWHT. Product Line: MIXIT↑. Manufacturer: Belkin International, Inc. 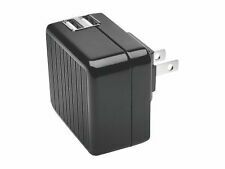 Product Type: AC Adapter. Galaxy Note 4. Images shown are for demonstration purposes. USB Device. We believe in our products, join BlitzWolf to get what you want. We back them all with an 18 months warranty and provide friendly and convenient. 1 BlitzWolf® Warranty Card. QC3.0 2.4A 30W Powerful Output. Marke Kensington. Power Bank / Portable Battery. Verbindung USB. Cases / Bags / Cover. Cover / Cases / Bags. Voip Phone. PRODUCT INFORMATION. Buy accessories. Anker PowerPort 4 Lite The 4-Port USB Wall Charger From ANKER, America's Leading USB Charging Brand - Faster and safer charging with our advanced technology - 20 million happy users and counting Advanced Charging Technology PowerIQ intelligently identifies connected devices while VoltageBoost compensates for cable resistance to charge virtually any device at optimum speed. Multi-Port Charging 4 output ports equipped with Anker's exclusive fast-charging technology pump out 27W to simultaneously charge up to 4 devices. Superior Safety Anker's MultiProtect technology combines surge protection, short circuit prevention and other advanced safety features to keep you and your devices safe. 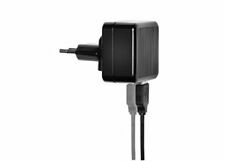 Travel Ready International voltage compatibility and interchangeable UK and EU plugs make PowerPort 4 Lite ideal for travel. 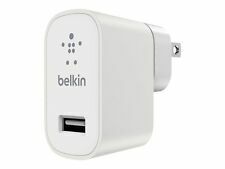 Belkin F8M731drWHT Indoor White. Network & Comms. Product colour White. 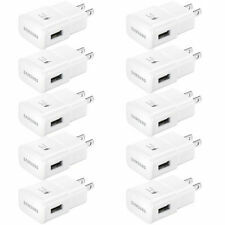 USB 2.0 ports quantity 1. Print & Scan. What do I do if I have not received my order when expected?. - Smart circuitry protects your device from power spikes.